Yahoo recently did some research on OpenID. The results were pretty poor, but I’m not surprised. I think the big problem with OpenID right now is that we’re all thinking about it like geeks. The main benefit to the user is that he/she doesn’t have to sign up for yet another account – or give out a potentially sensitive password (considering most users only use 1 password everywhere). I don’t know what the percentage is, but I would bet nearly all (US) users have accounts at one of yahoo, aol, google (and maybe a handful of other openID providers – google is only supported through an AppEngine app). I think the UI below would make openID more understandable to more users. You have any thoughts? Please see my comment on the Yahoo dev blog, too, about the providers also providing a translation from their existing authentication credentials (username / email address) to their own crazy OpenID URLs as a method of easing the transition. And I do believe it to be a transition: leaving the old username and password credential model firmly in the past. 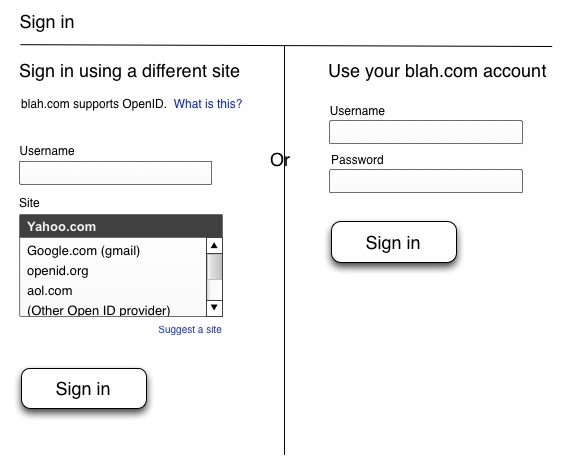 Not to sound like an authority, but the ultimate goal behind OpenID (particularly coupled with OAuth) is that I don’t _need_ an account with blah.com at all. In fact, if I was creating blah.com as an OpenID RP, I wouldn’t even offer the user an option to create an account, just an OpenID login. @David – I totally agree. 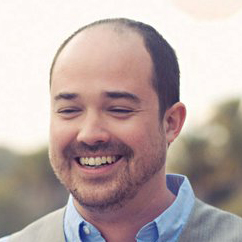 If I’m just starting out a site… I wouldn’t add the ability to create a new account just for that site. However, it makes sense that medium-large sites (or sites with a corporate bent) would allow you to create an account just for that site. They should be “good citizens” and become openID providers as well. Many sites allow you to use an email format for OpenID – which is awesome… I always use my @yahoo.com instead of my obscure yahoo openID url. Why not integrate the two forms? The “username” field is common to both. Add “blah.com” to the list of sites, and when selected use a bit of scripting to enable (or make visible) the password field. When any other site is selected, disable (or make invisible) the password field. how can i check this one Hotmail id have how much ids verifcation …u have any idea so Tell me i waiting ur reply….